Sub-Mariner Marvel Video Slot Guide & Review - Casino Answers! 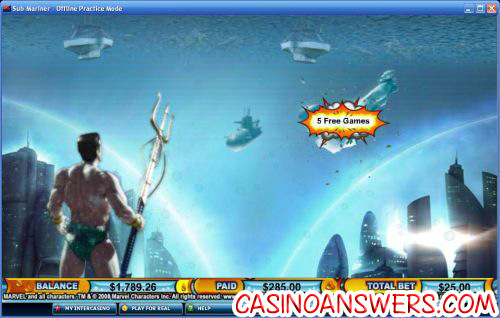 Sub-Mariner is a 5-reel, 3-row, 25-line video slot based on the Marvel Comics character Namor. It includes scatter wins, multipliers, free spins, a three-tier progressive jackpot and a bonus game. You can play the Sub-Mariner slot machine at Cryptologic casinos such as VIP Casino and Casino Joy.Play at this years #1 online casino for United States - Slots.LV. The Sub-Mariner Marvel slot machine can be played as a penny slot or you can bet as much as $125 on a spin. The complete list of bet options available are $0.01, $0.02, $0.03, $0.04, $0.05, $0.10, $0.15, $0.20, $0.25, $0.50, $0.75, $1, $2, $3, $4 and $5. We recommend you bet as much as is sensible for your budget, thus increasing your chances on winning a progressive jackpot. 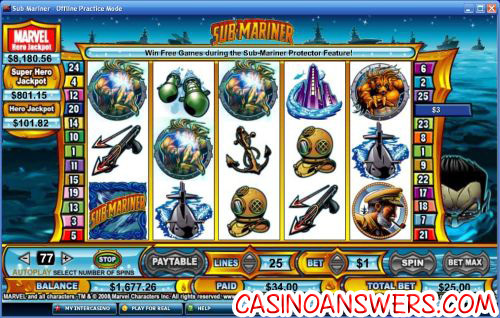 Sub-Mariner is linked to three progressive jackpots – Hero Jackpot, Super Hero Jackpot and Marvel Hero Jackpot. The Hero Jackpot starts at $50, Super Hero Jackpot at $500 and the Marvel Jero Jackpot will start at $5,000. No matching symbols are required to win here – Marvel progressive jackpots are won randomly! However, you can raise your odds of winning if you bet more money. The top jackpot in Sub-Mariner is 5000X your bet when you have 5 Namor the Sub-Mariner wild substutes appear. If you get these symbols on reels 1 and 5, you will activate the Sub-Mariner Swim Feature. Namor will swim across the reels and change some of the symbols into wild symbols. Additional payouts will then be awarded, if necessary. Wild symbols will substitute for all symbols except for scatter logos. If three scatter logos appear on a spin in Sub-Mariner, you will unlock the Sub-Mariner Protector bonus game feature! You must select three of the six warships and subs. Each one will award you with a cash prize or free games. The prizes are doubled during free games. The Sub-Mariner Marvel Comics slot machine is an excellent offering from Cryptologic. The video slot has plenty of features, multiple ways to get some big wins and some really nice looking graphics and animations. If you’re a fan of Namor the Sub-Mariner and want to try this game out, you can get a 100% up to $225 match bonus to play Sub-Mariner and all of the other Marvel Jackpot Slots over at VIP Casino! Where can I find a US-friendly casino to play Sub-Mariner? We wish we could find you one, but none of the casinos currently carrying the Sub-Mariner video slot are accepting players from the United States of America. Instead, you might want to try some of the exciting iSlots like Heavyweight Gold at Slots Jackpot Casino. Does the Sub-Mariner Marvel Comics slot have a bonus feature? Yes, if you get three scatter logos (the Sub-Mariner logo) from a spin in the Sub-Mariner game, you will trigger the Sub-Mariner Protector Feature. You will be taken to a screen where you are underwater, looking at four battleships and two submarines. You must choose three of these to blow up. From each one, you will receive either a cash prize or free spins. How do I win progressive jackpots in the Namor slot? All progressive jackpots are won randomly in Sub-Mariner. However, you can make sure to increase your chances of winning by betting more. The three progressive jackpots are labelled Hero ($50+), Super Hero ($500+) and Marvel Hero ($5000+). They can be won in free play practice mode. Is there a Namor Marvel slot? Is there a submariner marvel slot?